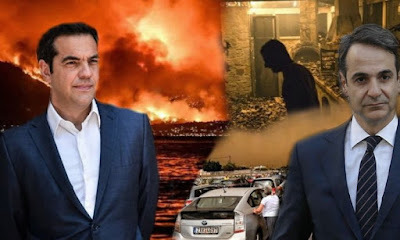 With measures-mockery, the SYRIZA-ANEL government is trying to throw dust in the eyes of the fire victims, and to appease their fair indignation and at the same time conceal its criminal responsibility for the murderous disaster. New Democracy and PASOK are pursuing the same thing, by voting in the Parliament alongside the government the crumbs for compensation and the amendment for the illegal properties, which literally excludes the current institutional framework of commercialization of land use, forests and seashore. This is also a proof of their strategic partnership in the big and important for the capital issues, while they- supposedly- "fight each other" for issues of fire management and for the "incompetence" of government officials. The criminal nakedness of the state apparatus and the inadequate planning of civil protection, with the devastating effects we have experienced, consists a timeless responsibility of all governments including the current one. This is what they are trying to conceal behind their agreement to measures that do not even address the consequences and, much more, the real causes of the massive destruction. Let's get things in order: The compensation voted in the Parliament not only do not correspond to the magnitude of the damage suffered by residents and small professionals, but they much more "depict" that a huge Golgotha ​​begins now for those left behind to see the debris caused by the policy of today's and previous governments. What could someone refer first? The €20 million announced as a fund to support a whole damaged area? The 5,000 euros that they give for a damaged house and a damaged car? The fact that there is no announcement of remedial measures for damaged houses, but only some reports of low-interest loans to the fire victims, which lead them to the "arms" of the banks? The measures relating to... temporary exemption from vehicle registration fees for burned (!) cars, or those that provide a temporary exemption from the payment of taxes, such as ENFIA, for one year, while we are talking about burnt houses? Respectively, the arrangements for the demolition of illegal buildings are the definition of audacity and hypocrisy of the government and other bourgeois parties that voted for them. Not because there are no buildings that have to be demolished. But because the government has demolition protocols for villas in areas which have been burned three years ago. Not only it has not touched a single brick of them, but with its amendment it equates the illegal house of a day-laborer, for which [the government] receives ENFIA tax, with the villas or buildings of large enterprises that have closed access to the seashore or have abolished it. Furthermore: This government, like the previous ones, has taken action and passed laws for the allocation of forests, woodlands, coasts and mountains to business groups. On the opposite side are the proposals and measures required by the KKE, which has submitted a Question to the Government bringing in Parliament the fair demands of trade unions and local institutions of the burned region. The KKE, among other things, requires to support and compensate residents and professionals in the region for the 100% of the total damage, as well as measures to effectively support workers, self-employed and unemployed people by freezing debts in tax office, the OAEE, banks, without any surcharges and interests; a complete write-off of bank loans for workers and families affected by fires, a full discharge from ENFIA, rent subsidies for residents and professionals forced to rent new premises, exemption from municipal taxation, etc. At the same time, the KKE urges the people to decisively invigorate the struggle so that we will not mourn any more victims and material disasters such as those in Mati, Mandra, Saronikos and the older ones, such as in the Peloponnese in 2007. The people must directly claim actual specific measures for fire protection and flood defense projects, predictive and preventive infrastructure, real-life contingency planning, targeting the system that sacrifices popular needs at the altar of profitability of business clusters.